Efficiency and comfort are the reason why many people rely upon our services. Transport in your own car, from 1 to 4 persons, or Mini-Van from 4 to 18 persons with lugage, fitted to suit your needs. 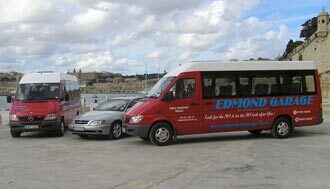 All vehicles are fully Air conditioned to make sure you are comfortable even in the hot climate of Malta. All our drivers are fluent in the English language and are very friendly and helpfull. If you have any queries don't hesitate to ask. Our drvers are going to take you in your destination without worries and in the most pleasant and comfortable way. Click here to view our vehicle Fleet Gallery.